HostGator is a world leading provider of web hosting. Since 2002, company is privately owned and based in Houston, Texas. Since then, HostGator has grown from a small hosting company with just three servers into a world leading and industry recognized hosting provider with more than 12,000 servers under management. The over five million domains hosted by HostGator make up approximately 1% of the world's Internet traffic. As a technology and product innovator, HostGator is able to provide its more than 400,000 customers with innovative products and services designed to complement their existing businesses. HostGator serves customers ranging from individual freelancers to Fortune 500 companies in more than 200 countries. The company is constantly working to improve and refine their service and support. 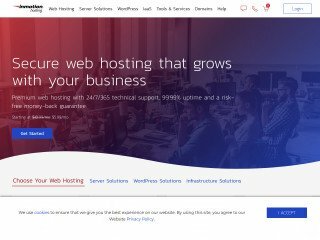 When friends ask us for a good web hosting provider (and believe us, they surely do) we have a very solid suggestion for them: WebHostingHub.com or InmotionHosting.com. 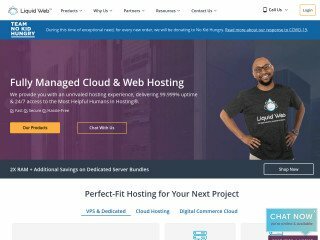 Both of these hosting companies provide unparalleled support for all of our web hosting needs, and make it easier than ever for us to realize our Internet dreams, turning them into profitable realities. But today we wanted to talk about HostGator.com (read our HostGator user reviews), another great web host with pretty solid background. All of this excellence begins with their lineage starting in 2002, the year of HostGator’s birth. Since that first initial step in Houston, Texas, the company has grown to support a whopping 12,000 servers, all under direct, controlled management. In addition, HostGator proudly services and aides a network of some 400,000 customers in more than 200 countries. No other web hosting provider can claim to support such a varied network of people, much less put their name to half the global presence HostGator offers. All in all, the company’s track record alone is enough for us to hand over our digital keys. However, we know you might need a bit more convincing. With that in mind, below you’ll find a few of our choice reasons to sign with HostGator, though its hardly a comprehensive list: With HostGator, its hard to find an end to all the pros! First and foremost, HostGator offers every kind of hosting imaginable and then some. Furthermore, if you’re a bit lost about which hosting variety is best for your needs, HostGator can help with that, too. For example, let’s say your business already has a shared hosting plan (that’s a plan in which you share a server with potentially thousands of other users) and needs a more stable environment. As such, HostGator offers, and will suggest, their dedicated hosting plan, which provides you with a fully managed server of your very own to place your website on. Though, if you require traditional shared hosting, HostGator is more than happy to provide this level of service as well. Likewise, should you need the localized control and stability of a virtual private server, which blocks your content off from outside abuse through operating system virtualization, HostGator is ready out-of-the-box to help. Not to mention the company’s extensive support for reseller hosting, which allows you to take a chunk of the HostGator network, and redistribute it for a profit to others. HostGator also offers 24/7, round-the-clock technical support for any and all problems you may encounter. This support can not only be reached when you need, but also where you need it: With phone lines, chat rooms, and email inboxes open all day long, HostGator is sure to return any complaints with a speedy solution—every time! Bookmark http://www.hostgator.com/contact.shtml just in case you ever need to contact HostGator. In terms of sheer quality and performance, no one out does HostGator’s shared hosting plans. To begin with, choosing to sign with HostGator will only cost you $3.71 a month with a new contract. That is a special offer for WebHostingGeeks.com visitors! And for that low price of less than four dollars a month, HostGator offers truly unlimited service from the ground up. HostGator 25% OFF Coupon Code: “GEEKS“. With unlimited disc space and unlimited bandwidth, you will never again have to worry about size or data transfer limitations. In fact, at the next price range—which begins at only $6.36 per mont—you can also enjoy unlimited domains, making shared hosting a definitive reality for your multi-domain business. Lastly, HostGator’s shared hosting plan comes stock with a wealth of additional features including a 99.9% up-time guarantee, as well as a no contract 45-day money back guarantee. Add to this a world-class cPanel experience, a free website builder, and almost 5,000 free Website templates, and you’ve got one seriously incredible shared hosting plan on your hands. If you’re a new web hosting provider looking to take a superior chunk out of your peers, HostGator’s reselling options will give you an instant leg-up on the competition. The provider works hard to make your reselling experience an easy and efficient one, providing you with the tools you need to please clients and turn a profit. For starters, HostGator provides each and every one of its reseller accounts with fully functional client management and billing software. These tools are indispensable when it comes to managing your growing business, and make the difference in your livelihood as a reseller. In addition, HostGator also offers a bevy of unlimited options, including unlimited domains, sub domains, email accounts, MySQL databases, cPanels, and FTP accounts. And with plans starting at only $19.96, becoming a reseller host has never been cheaper, as well as easier. 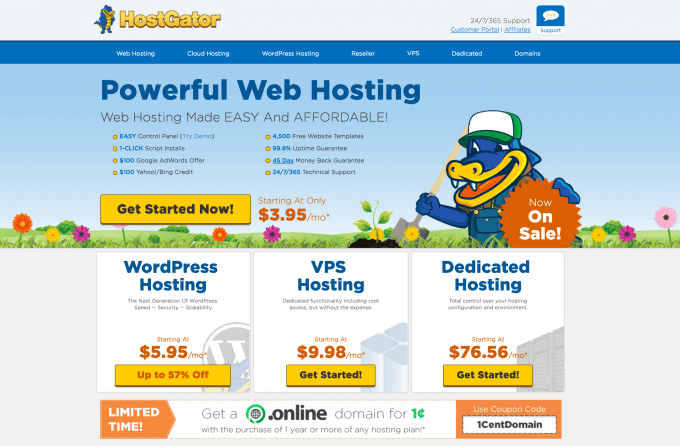 Visit HostGator.com for more information about their reseller hosting services. If you’re looking for a dedicated server experience without the budget bite of the real thing, there’s no better option than virtual private servers. And if you’re looking for a quality VPS host, there’s no name worthier than HostGator. The provider’s comprehensive VPS plans start at only $15.96 a month, earning you a wealth of additional features for far less the cost of a physical dedicated server. As with its other hosting plans, HostGator offers a menagerie of unlimited options for its VPS costumers. These include unlimited domains, sub domains, email accounts, MySQL databases, and FTP accounts. HostGator’s VPS accounts are also fully managed with cPanel or Plesk, and support several different levels of experience, working to meet your needs where they are. Yes, the list continued and don’t turn that dial just yet! there is much to say about HostGator. Thus far we have not quite covered all of the critical elements, a fact that should come as no surprise, considering the mountain of features and feature sets that HostGator offers. With that in mind, let us continue to examine the host and offer you, the reader, a deeper look into the incredible services the company offers. 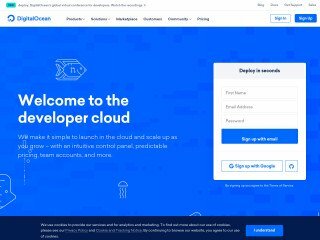 If you’re considering a quality VPS host, shared host, dedicated host, or even reseller host, HostGator is one of the best in the business, and we’re about to show you how! Starting with one of our favorite aspects about the provider, its incredible dedicated hosting potential. Visit HostGator.com for more information about their VPS hosting solutions. Within the realm of dedicated server hosting, HostGator splits its services across two unique operating systems. The first of which is Linux. All HostGator dedicated servers in this category come stock with a free and secure, server edition of CentOS that’s guaranteed to manage your files easily and with the tightest possible safety. Best of all, those with the technical knowledge can benefit from HostGator’s full root access that’s allowed to the webmaster, as well as the available choice between either a 32-bit or 64-bit hosting experience. Even better, all HostGator dedicated servers with a Linux flavoring come loaded to the gills with the latest in web hosting software: This includes cPanel with WHM, Apache Web Server access, MySQL 5, PHP5, Perl support, Python ready hosting, Ruby on Rails, FFMpeg support, and even free WHMCS or WHM client management and billing software. All in all, signing with HostGator for your Linux-oriented dedicated server needs is a great way to get the most bang for your buck, right out of the box. HostGator’s Linux dedicated server plans begin at only $139 a month, a rock-solid bargain for the business or personal user looking to form a dedicated presence on the Internet. For that money, users can enjoy a full Intel Xeon Quad Core processing experience, 2 GB DDR3 memory, a dual 250 GB hard drive, and 10 TB in bandwidth. At a lowly one-hundred and forty dollars a month, that much functionality is an incredible steal, regardless of the budget you’re operating on. Visit HostGator.com for more information about their linux dedicated servers. Like HostGator’s Linux dedicated server hosting, the Windows side of the company’s dedicated options sports an impressive array of features and hooks designed to obtain your business and trust. For example, all HostGator Windows servers come stock with Windows Server 2008 R2, complete with remote desktop and a 64-bit system on demand. Likewise, the latest in Parallels Plesk is offered here in conjunction with IIS Web Server, MSSSQL, MySQL, FTP Server, DNS Server, and even a SmarterMail Professional Mail Server. All of this functionality, of course, is kept under guard by a secure Firewall and IPsec Policy. And like HostGator’s Linux servers, all Windows dedicated offerings are fully managed, requiring no additional overhead for you or your board to worry about. All in all, HostGator is simply one of the best places to find secure, stable, and up-to-date Windows dedicated hosting. Visit HostGator.com for more information about their windows dedicated servers. And it’s not just server excellence that HostGator is offering: The company is also responsible for some seriously killer control panels, too! With every Linux-based shared hosting account, users are given full, unrestricted access to the latest edition of the popular cPanel platform. This platform comes totally loaded with Website statistics thanks to such quality plug-ins as AWStats, Webalizer, Raw Log Manager, Referrer and Error Logs. There’s also support for popular services like Fantastico, password protected directories, and custom error pages for all of your sites. In addition, users who choose such an account can benefit from an easy-to-use and graphic file manager that makes moving and creating files a cinch. http://yoursitesIPaddress/cpanel (For example, type http://50.22.22.170/cpanel). For everyone else (Reseller accounts, VPS hosting, and Dedicated subscribers) the same cPanel quality can be obtained, even with many of the same features. This includes the latest WHM Control Panel with multi-language support, server status monitoring, package limiting, disc space distribution, and complete control over passwords, DNS accounts, tenant restrictions, and even branded materials like client panels. And, of course, the Windows side of this server coin comes loaded with the extremely popular Plesk control panel, offering all of the above features and more, including an application vault and redirected URLs. There are a few ways to log into WHM. The best way depends on if your domain name has propagated yet. http://yourIPaddress/whm (For example, type http://50.22.22.170/whm). Lastly, we’re blown away by HostGator’s unprecedented support for popular dynamic web applications like WordPress, Joomla, Magento, Wiki Hosting, and phpBB Hosting. 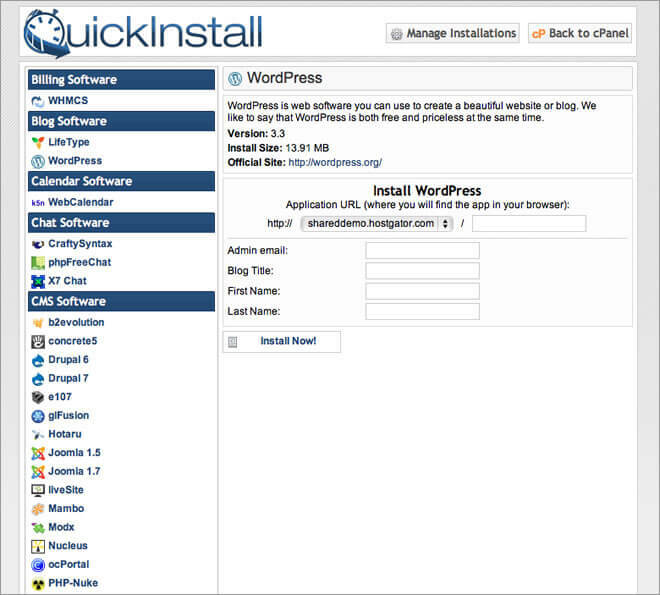 Specifically, they’re unprecedented appreciation for the power and potential of WordPress is to be applauded. The company makes it quick, easy, and affordable to create a WordPress-powered website in only minutes, even allowing users to port their old WordPress blog along, adding it to a dedicated space with no additional wrangling. The same applies to other content management systems like Joomla and Drupal, allowing the blossoming blogger to fully realize their potential with hardly a scratch on their budget. All in all, HostGator looks to be one of the largest, most trusted, and most feature rich hosts around. If you’re looking for quality shared, VPS, dedicated or reseller hosting, there’s (on paper) hardly a better choice. The plans are cheaper, the features unbeatable, and the customer support truly rock-solid. The performance itself also looks to be absolutely superb, when compared to other industry leaders. 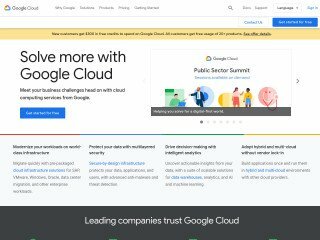 The company has won hundreds of awards over the years, including some of the most prestigious from WebHostingMagazine, FindMyHost, and WebHostDir. However, our users here at Web Hosting Geeks have had some other things to add. If you’re looking for a quality web host, HostGator looks a fit to us, but before diving into the provider, be sure to check some of our quality, user written reviews here. In our eyes, it’s our job to inform you about some of the largest names in the web hosting industry. In other words, we look at the corporate giants that are constantly vying to steal your money and attention, and our only thought is, “What’s wrong with this provider?” There are a lot of quality options out there, but on the other hand, you’ll find just as many rotten experiences. In today’s article, we’ll be analyzing the not-so-good of just one such hosting provider. HostGator.com has been in the industry for a long time, and has earned more awards than we can shake a stick at. However, if you think they’re all gold and sunshine, you may want to jump on down below the break to view some of the user complaints we’ve received against the company. We’ve compiled a few of the more common ailments just below the break, but before we dive into the what of what’s wrong with HostGator, let’s talk a bit about the who. If you’ve managed to search the web for quality hosting without encountering HostGator, we haven’t got a clue how you did it. HostGator has been in the business as long as we can remember, and during that time, they’ve been racking up the awards left and right. Their main focus is on cheap shared hosting, but they also offer quite a few additional services, like virtual private servers. Their plans are rock-bottom, but they’re also guaranteed with an entire list of “unlimited” benefits. All in all, they look like every other big name hosting provider on the market. But are they really all they crack themselves up to be? For that, we’ll have to dive into the treasure trove of user reviews we’ve stockpiled over the years. So without keeping you waiting any longer, dive on down below the break to see what our reviewers are complaining about the most with HostGator! Not-So Obvious Pricing: First and foremost, HostGator advertises a single low price for their basic shared hosting account. However, as many of our reviewers have pointed out, you shouldn’t let that number fool you! You’ll have to sign up for an entire year to get that price, and if you decide to do anything shorter, you’ll be paying a higher premium. Granted, this is hardly a deal breaker, but we felt you should know, especially as so many of our users have been talking about it. Throttled Service: On a more disturbing note, we’ve also been hearing reports that HostGator throttles the performance of accounts as soon as their 30-day money back guarantee has expired. Apparently, once the safety nets are off the company will drastically reduce the overall performance of the site, so much so that it’s noticeable on the front-end. We can’t guarantee these reports are true, but we’ve certainly heard it from enough of our user base to think it’s at least plausible, if not probable. No Notifications: To dive into another area of the common complaints we’ve been getting, it appears that HostGator’s technical support can be somewhat lackluster. Most noticeably, our users have been reporting a lack of reports. In other words, their accounts have been removed, modified, or even been down without any sort of notification of a change in service. It appears this is a tactic to avoid being blamed for server problems. At least, that’s what our users have been saying. The common trend is apparently the need to pester and badger the technical support representative until, finally, they admit to a server-side problem. Obviously this is a terrible way to run a business, and it appears the reseller hosts are suffering the most. Lack of Knowledge: On another note, it also appears that HostGator’s support representatives have been unable in a lot of cases to solve the problems our users have been facing. Frequently, our reviewers have called up a tech support agent, only to have their situation either exacerbated, or worsened. Slow Service: Lastly, we’re hearing reports that the tech support service with HostGator is somewhat slow on the upkeep. It often took our users days to hear back from an eMail ticket, and even the live chat appears to be somewhat sluggish. cPanel Problems: To be honest, this is a complaint we don’t see everyday, but enough of our users have reported it to make it relevant. Apparently, the cPanel offers little to no support for languages other than English, producing overlapped fields and other such inconsistencies in service. If your primary language is English, this likely won’t be a problem. For others, we thought you should at least be aware. Broken Links: A slightly more bizarre, though no less common, complaint, we’ve been hearing that HostGator frequently breaks all the links embedded within a website, and with no obvious cause. One morning, many of our users awoke to find their links simply broken. As mentioned earlier, tech support didn’t appear to be of much help, and in all but a few cases, our users moved on to a different hosting company. Database Errors: We see this with a lot of shared hosting companies, but our users have reported more database errors than most with HostGator. It appears housing a database with HostGator is somewhat risky, often leading to overloaded requests or sites that simply don’t function correctly because of it. So there you have it! Those are some of the more common complaints we’ve heard about HostGator, and though it may seem all negative, we feel we should mention that we’ve also heard good things about them. This is why you should always check WebHostingGeeks.com for the full review of each and every web host you’re considering! We’ll always cover the pros and cons of the most popular options, and no matter who you’re looking at, we guarantee we can keep you informed. Feel free to inspect the provider yourself at HostGator.com. And, of course, their trained representatives are always standing by, at the ready to field your questions as they arise. In other words, don’t just take our word for it: Let HostGator dazzle you as it’s dazzled us. Just happened this week. I bought one of their plans and requested a site transfer. It took them more than a week to complete the migration after so much confusion and follow ups with their liars to the bone chat support. After the migration, the site was loading without SSL and showing unsecured site and I cannot even open wordpress admin page. Contacted the liars to the bone chart support and heard the same pattern of lies. The issue was never resolved. Their techs is like you are talking to a wall that never respond. I have my package plan and account with Hostgator canceled. I don't want to be associated with a host provider with the worst support in the world. For you who is looking for a host provider, don't ignore all the bad reviews here like I did, you will regret it. This happened just this week.. I ignored all the bad reviews here about Hostgator and I regretted it. I bought one of their shared hosting and filled a migration request form with all the necessary information. It took them a day to ask more information, then another day to ask more. After the last information I gave, I don't hear about it for a number of days. Everyday, I have to get intouch with their chat support, every time I was told the migration is in progress or taken care of. Everyday I follow up in chat support not only once but a number of times everyday and the answer is almost the same except for statements like we are asking help from our manager for the issue which made me wonder why they need the help of a manager for something that is included in the package? and keep on asking if I have an issue later after the migration I will wait like this everytime? and I was really afraid. It was like it for a number of days until one day the chat support finally received a message from the migration team asking for the backup location that I already gave earlier. After all the time I was told that the migration is in progress, it turned out that it is actually not started. All the chat support people were lying and lying everyday. Finally, I received an email that the migration was completed.and that is after more than a week. To make the story short I changed the DNS and pointed it to Hostgator. Then issues started, the site was showing it is unsecured and I can't even open the wordpress admin page. I have contacted the chat support and I receive the same pattern of lies during the migration, like they have submitted a ticket for the issues. and they have to talk to their manager to ask help. The thing that I dreaded is happening. The issue was never resolved until I gave up and have everything cancelled, pointed back DNS to my old webhost and everything is fine. I can't believe there is such a webhost with a very very very bad support like Hostgator.. All the chat support agents are liars to bone. For everybody who are looking for a webhost, do not make the same mistake I made for ignoring the reviews here, you will regret it.. If there is no star in the rating that mean I cannot have even one. HORRIBLE FRAUDULENT COMPANY! I called this company , to inquire about transferring my websites from a bad-service provider. HostGator lied and said they would have it transfered overnight if I made the payment. I did, they fucked around for 3 months, held me hostage, stole my website and data and wouldnt provide backups and black-mailed me to upgrade and pay more money and after 1 year of insane amount of e-mails and phone calls, they still have been moronic bullies who literally engage in cyber-warfare and should be sued into oblivion and the owners imprisoned! God exists, so karma will come eventually! They offer unlimited disk space but if you use too much they will force you out. They have denied my ability to install perl mods by restricting permissions and then tell me it's not offered with my account when it clearly is. STAY AWAY. Since HostGator made SiteLock, a security firm, their partner site, sh*t hit the fan. They purposely put malware on my sites and then asked me to get it removed professionally via guess what?? Yeah, SiteLock! Just to squeeze more money out of their customers HostGator is now using 'dirty tricks' to subsidize their income. It's damn shameful for a company to do this. I know other people have had this issue too with them but if you still feel they are an ethical company then by all means use them. It's your money to burn! I didn't listened to the reviews on here and purchased their service, only to find out the hardway. That what everyone was saying about them would happen to me too. These guys have lots of employees/contractors and can manipulate reviews to burry the real ones. My word of advice, look for an alternative solution to hostgator. I took the free SSL service they offered me when i signed up, then my website got hacked. Because all of my other sites and subdomains were under the same folder, they all too got hacked. (they put everything under one folder for some reason) I had previously contacted them about this being a vulnerability and how can we fix this, they would always just try to upsell to a different plan that didnt fit my needs. After I got hacked, they offered their partner service "SITELOCK" its about $70/month/12 months per site, you can do the math if you have multiple sites. I got a 3rd party service to remove the malware but I was told by the 3rd party company that timestamps were different from the previous day and now my account had virus again. Everytime i contacted hostgator they made me wait long periods of time, then after waitting they would tell me they could not help me, it violated terms of agreement. To purchase sitelock. I contacted them to confirm if my account was still infected or not. They would always tell me, to purchase sitelock they would be able to tell me. I contacted sitelock, they said they couldn't tell me, only hostgator would be able to do that. I literally had to purchase their service for everysite, wether it had virus or not as they couldn't verify anything for me, and thats pretty much what I had to do. I paid them more, way more than I needed to have my server cleaned, then cancel the service with hostgator a year before end of term and got no refund and had to migrate my servies to another provider. I HIGHLY RECOMMEND YOU NOT PUT YOURSELF IN A VULNERABLE POSITION AND BUY HOSTGATORS SERVICES. I've been a hostgator client from 2012, few months ago my website was hacked, i didn't get any help from hostgator to get it back, they didn't have any backups (that website was about 4 years old on that server, no backups) i've made the entire website again, was a presentation website + blog (imagine all the work, find all the pictures, text...) And i had 3 of these website on that server, all compromised. All redone. Today i wanted to check something on my website and ...nothing, blank page. Index of /. I was contacting hostgator to ask what happened, where are my files, they don't know, their reply: "I have checked your domain's directory and I see no files in there. May I ask where are your website files located? That was their answear "D'oh!. I was asking for a backup, they have one, but it will cost me $25 to give it to me. Now i'm asking, is not their job, to not get hacked in the first place? And second, they should give that backup archive for free to help their paying customer. For this i'm canceling the account and i will search for a company that values their customers. I would not use hostgator, their 45 money back is a lie. I was told this morning that the cpanel glitch I am experiencing, 4 of my email addresses are not responding and not appearing on my cpanel, is internal. Now my own emails are not working. I called customer support and they said there is a 24-48 hour response time from admin tickets. How is one supposed to run a business with no email and error returns to inquiries? I will not be with Host Gator within the week. Wow! The agent I was chatting with for almost 60 minutes was inexperienced. Turn out that while chatting I decided to call their Tech Support and in a matter of 2 minutes the issue was resolved. Thank you so much for fixing the issue. Next time instead of chatting I will call in. Chat proved to be a waste of time. If your domain is coming up for renewal or you need to do a transaction, please be advised that Hostgator is unable to accept credit card or PayPal. Your only means of ensuring your transaction is paid for and your domain is not cancelled for lack of payment to renew is to keep a log yourself and send them cash, check or draft in the mail or EFT. In this digital era, I feel like this is the dark ages. Moving my business. Too busy for the inconvenience. I have no time to go to the bank and then to the post office. Billing System Does Not Work and no one there can help!!! Does anyone know what is going on at Hostgator? lately, their service has decreased. Your domains expire almost set to cancel, even after you have paid the renewal fees. Now, I have several other domains coming up for renewal, purchased an SSL certificate and other transactions. The billing system that used to work, no longer work and I cannot pay my invoice. Their website said to send cash, cheque or money order. Really?? In this digital era, I have to send you 4 different payments. BTW, I have so many domain and services with Hostgator, does a business person has time to sit down and monitor what domain is due and how much, then send the payment? Seriously, I am one dissatisfied customer. DISAPPOINTED!!!!! To image I even just gave them a new customer. Good thing I am not too far in and can switch to another hosting company for my client. Don't know where to start. Tech Support does not have tech knowledge. Seems like they read the help forms. Response time with Tech Support has big lag times. 2-10 mins. Their Free SSL sold with package have known bugs and might or might not work, according to tech support. *Screen Shots. Also seems more like a bait and switch, pay us more money if you want it to work. Their website builders have numerous problems. Google analytics ID won't work when imputed into fields. Must know code to enter site title, description, ect. Support states Free Builders are not for SEO, paid for use to build website. More money. Also site won't show or index on Google. Not really sure what is going on here. Code is in site HTML, but is not recognized by any check or google. Therefor you will not show up on google. If you check code, free site builders is coded for spiders or Robots-Tag "noindex, nofollow". This is the biggest joke I have ever seen. Customer Support worse than any cable company! I had been a long time hostgator customer... but over time their service has gotten worse and worse... their customer support is down right deplorable... I won't recount the countless times I've spent disappointed on chat support only to have my session end with out any resolution. They don't have phone support, or email or even a ticket system anymore... ON TOP OF THAT their domain prices are higher than most competitors, Their hosting tools and platforms have gone through so many evolutions and changes that it's impossible to use much less find anything... but worst of all is the constant apologizing if you get on chat with anyone they apologize non-stop for how terrible they are.... just stop. STOP BEING TERRIBLE and you'll stop losing customers. HostGator support used to be half decent. Of late no tickets can be logged - only live chat. Live chat is great for quick stuff. You would think a request to enable "mail" would be quick - nope. Took 1 hour only to then be told HG no longer supports command line emailing. Support told me it was out of their scope and provided me with a link to email from a webpage (not at all what I wanted - clearly no idea what they're doing) and to "contact a developer". Also cronjob not emailing - took 30min, end result - "contact a developer" - REALLY, is their blimming hosting and I must contact a developer (spend money) who would then have to contact them anyway?? Just RIDICULOUS! Do NOT use them if you want to do even slightly "complex" things like just using bash scripts. After careful research I decided to transfer from iPage to HostGator. I paid my money and sent back their form requesting a Domain transfer. Nothing happened. I contacted their chatline - lots of pleasantries about a long queue. 3 days later I contacted their chatline again - this time they gave me a ticket number and said their admin would be in touch. Nothing happened. Chatline twice more. Got fed up and submitted another transfer request. Got a response with a new ticket number requesting further info which I sent immediately. No response. Chatline twice more. Chatline said my response had not been received. I sent it again and also copied it on chatline. Chatline said that their admin had now received it and promised conclusion of transfer in 24-36 hours. 36 hours later nothing had happened. Chatline agin. They said no response received to admit original request. I copied them transcript of chatline saying it had been. Chatline contacted admin and said i was now highest priority. I had heard this before and requested removal of account and refund of sub. Chatline said i would hear from billing within 24 hours. I have not heard yet . . . The whole process has taken over two weeks. Pathetic. Suggest you do NOT sign up with these incompetent oafs! I paid since July 19 for my domain to be renewed. I found out about August 17 that Hostgator caused my domain to lapse. I am tired of calling them and hearing the same thing they need to escalate to billing. Yet my business domain is still down and I am loosing money each day. I have so many domains with them but now after they lack of care - no follow up - getting the run around - wanting to charge me to pay for it to be recovered feom enom - poor poor service. I feel because I am a small business no priority is given to fix my domain. I left Telus where I had no issue but paid more for a cheaper service that caused me loss, frustration and heartache. Using hostgator shared hosts since 12month now with some really bad experiences: -althought I made a downgrade, they charged the full amount (the amount for the biggest shared hosting package). After incisting, they told me that their system made a mistake but they will correct it and refund the amount payed to much. Unfortunatly, I have to pay $10 for this activity as it has to be done by admins. -in an earlier case, I already had to pay for adn admin activity ($10 each) -they needed 4 weeks to install an ssl-certificate (which was not issued in the US) -the chat is a typica "call-center-chat" and wasn't able to solve any of my issues in the past. IN all cases, a ticket for the technical admins had to be created by the chat-people. This means: you don't have and real-time-support, the only support-system working is the ticket-system My overall experience was a really, really bad one so I'll shift over to another host after they refunded my money. There price is good if you are ok with marketing their gator etc. They really charge you for all the bits and pieces that are included in other packages. Ive had 3 domains suspended after not renewing hosting package. I switched hosting providers but kept the domains with hostgator. Well they have suspended my domains and blame the new host for not resolving. My godaddy external domains are working just fine with my new host. Dont do business with them. Dubious Credit Card FRAUDSTERS, CROOKS ! ! ! I received a notification from my bank of a successful Hostgator charge on my debit card. When I logged in to their billing portal, I discovered that the payment did NOT reflect on my account; in other words, the last unpaid invoice was still marked as unpaid. Simply put, their system took money from my bank account; and for some reason failed to acknowledge receipt of the funds. What makes the case even worse is the fact that I had deleted this particular card from the list of saved cards on my Hostgator billing account weeks ago; but it seems their system still somehow retained this debit card information and went ahead to charge a card that should have been deleted from file. I have now transferred all my websites to a new host BUT they make it difficult to cancel the webhosting service I had with them so they can have an excuse to keep on fraudulently charging my debit card for a service they are not providing. I liked the service at first until it took 3 weeks to migrate less than half a meg of data and the reps keep saying they can't do anything else, email feedback@hostgator.com. I did that too and NO one ever got back to me. I went on linked in and posted a note to other entrepreneurs to let them know stay away from hostgator. I was sad I left go daddy. I won't make that mistake again. the higher price is clearly worth the value, because hostgator may be inexpensive but they don't think ANYTHING of their customers and having a site down for weeks and just apologizing.. not gonna cut it. Worst hosting site also breach your data. Hi, One of my website is hosted on Hostgator. When traffic has increased in my website then they removed my database. And restored my development time DB. And when I asked by support team then they directly refuse and also charging for my current database backup. When I asked, please provide me evidence that prove that it has done by my end, then they are failing to provide me evidence.After that, they told me, sir backup is chargeable and you need to pay for it. Waste of money, don't get burnt as I did. Waste of money, don't get burnt as I did. I desperately regret using Hostgator, so many of the features don't work, the shared hosting is slow enough to render our website useless (and yes, of course we've used all the speed optimisation techniques such as cache plugins) and there's no customer service. They have a "Live chat" but it never works for technical help. 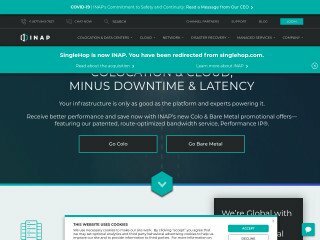 To speed things up, I asked if we could upgrade from shared hosting to cloud but they told me the only way to do that would be to buy a whole new cloud package (we paid for 3 years shared hosting just a couple of months back and they won't let us upgrade from that plan, we have to buy a whole new plan and lose the previous investment. It seems crazy to me because obviously we won't do that and they lose the extra revenue from us being on a more expensive plan). There service is so bad, and the support is so slow and without efficacity. It's not even worth to try the shot. Hostgator's tech support is the worst I've experienced. The chat center and even the phone support which is state side has no ability to actually help you. They promise satisfaction over and over, yet are incapable of solving the problem. After being a paying customer for years and years, Hostgator shutdown my site and erased information without contacting me me know. They can't explain why and are incapable or unwilling to help rectify the situation in a timely manner resulting in lots of lost revenue. Unacceptable. WORST every service that I have ever received. i got hacked and I have to pay the price for it by having my website shutdown. On the 15 July 2018 I have noticed my credit card was charged 4 times without my authorisation. After a bit of search I noticed my Hostgator account was hacked again for the second time in 3 month! Like the last time the hacker changed my primary email address and started purchasing hostgator's products! which to be honest looks like the only party profiting from this hack is hostgator. I am truly disappointed with the poor cyber security and costumer service of this host. The first time I was hacked I couldn't get access my account to pay for my annual fees so in turn Hostgator shut down my website and made me to jump through the hoops to prove my identity. they never admitted that their server was hacked. They took their sweet time with me. It took them 4 weeks before they grant me access. I lost revenue, I was stressed and my credit card was charged. These guys deliberately ignored my claim when I said my account was hacked. This is the second time and the method of hack was exactly the same as before. If my webmaster (included as the trustee and the secondary email) did not notify them and myself, I am very sure Hostgator would have never found out about the hack. I wonder how many others' accounts have been hacked this way. My account was hacked and a $250 purchase was placed on my credit card. To cut a long story short, it took weeks, multiple emails, calls and chats to get it resolved. Support multiple and inconsistent staff gave conflicting answers and make the entire ordeal much more stressful. Thankfully I did eventually get my money back. If you are okay spending two hours to place an order that should taken 10 min, Host Gator is the place for you. They are well beyond needing to stop outsourcing customer service or train customer service better. Their inability to provide decent service couldn't be overcome by the best service agent. Their problems are built into the system. Management is the problem. This fish is rotting from the head. As soon as I signed up with HostGator I got flooded with problems which lasted for about 3 months of talking with support to resolve the issues... Then I didn't have any problems for almost 1 year. Then they didn't update my SSL even though they automatically charged me for it. No warnings at all. After being told by a friend and seeing my analytics flat, I realized that my website was down. Took about a week or 2 to resolve this problem. I sucked it up again and kept going. I updated my website and it was loading really slowly so I upgraded to their Cloud Hosting with the assurance that the difference in price would be refunded back to me. The gave me a HostGator 'credit' instead... this upgrade was the beginning of a nightmare. My website was down yet again, their support tickets that I submitted previously were erased so I had to recover the previous problems and my email was dropped even though I asked repetitively on the whole process and procedure of switching hosting platforms... I wanted to make sure that this was a smooth process and since my business is operational, I wanted to avoid all problems. My email was down for about 3 weeks which noticeably impacted my business since I get most of it online. I didn't realize this until one of my customers sent me an e-transfer for a job and I didn't receive it. All of my emails during this time were erased. Any estimates for customers or replies or inquiries were completely gone!! This alone was over $5,000.00 worth in business. I rely solely on this business to survive and this was a huge shame... I decided to switch hosting so I told them this and they immediately deleted my hosting account... I told them specifically not to delete anything until the new hosting took over... Now my website is gone. I seriously don't understand how HostGator can survive as a company with their complete lack of competence. If this doesn't get resolved in the next few weeks, I am going to sue this company. Their customer service reps and server administrators are the most pathetic bunch of negative minded, ignorant and incompetent people I have ever come across. Their help page says ports can be opened for outgoing traffic for shared plans but when I contact them, they won't do it. Apparently "opening a port on this server is not good"...whatever it means. I canceled all four of my accounts immediately. I have honestly experienced hell with hostgator for the past 3 weeks trying to fix my website and this is coming from someone who never writes bad reviews about businesses. i personally think a bad interaction doesn't represent the company itself but with hosgator youre bound to get someone who has no idea what theyre doing 8/10 times, probably 9. these guys canceled my hosting, then cloned back my websites with out telling me that there was a charge to it. not to mention when they cloned everything they mixed up the contents of my websites so i have entire websites under the completelly wrong domain names, and honestly almost ripped my hair out trying to get someone to fix it. they only allow you to email their admins and only reply once every couple to a few days so don't even think about trying to get something in less than a week or two. i won't go into all the details because im beyond done with them, but TRUST ME, DO NOT use these guys! im warning you, it's THE WORST. With this service they will continue to lose biz. They went from 3.3 Million domains in 2013 and are down to 2.2 Million domains in 2018. They will be unable to maintain profitability in the short term. Horrible experience and they try to keep you hostage at all costs. Evasive answers and inability to provide solutions.. We moved far away from such a company, it might be contagious. Every year on 17 june my ssl needs to be renewed and every year my site is down for 1-2 days because they do not do their job. SSL have been bought from them configured from them and still every time on this very date my site is down. They are friendly when talked with them but that doesn't matter since result is my site being down. This wouldn't be an issue if they would allow me to install my own certificates and manage them but they have completely disabled SSL/TLS option in Cpanel (I dont know about shared packages but that is how it it is for Cloud Packages) so if you want additional SSL to be installed you need to pay them. I really do not recommend it anymore. Spoke to reps 11x, sent 28 DCMA takedown orders, sent evidence 29x. They ignore customer service requests even the legal department. This website was pirated and copyrights infringed and HostGator ignores multiple requests. Decided I'd like to host a webpage but quickly realized my schedule wouldn't allow for much time to dedicate to this idea. Cancelled not even a month after my initial start and I thought that was that. Come to find out that there is still an auto renewal of your domain name that's auto enabled even after you cancel your membership. So now a year later HostGator has charged me $15 and $12 for a domain name I haven't used in a year. What's better, these charges are non-refundable. What a joke of a company. Should have read the terrible reviews before doing any sort of buisness with these morons. Bought shared baby server. They used blacklisted IPs to send my emails. I never knew if an email would reach the recipient. My email address was blacklisted, and then my customer's servers blocked my company email address and added it to their Blocked email list. HostGator didn't care. I upgraded to a virtual private server for $1000 more. It took 3 days for emails to get set up, it took 10 days for the data migration. During the data migration, the migration technician messed up the permissions and our whole company lost access to the new VPS. Host Gator then put me in the general support queue and it has been 3 days still without company email. They do not reply to emails and while I can talk to customer support, the support team is not allowed to get an update from the migration team on the progress of my ticket. WORST CUSTOMER SERVICE EVER. Inept technicians working on your servers and service teams are isolated from the support teams. No help whatsoever. I cannot recommend HostGator. Actually, I am leaving Hostgator as soon as I can. Been with HostGator for many years, but they have gone downhill recently. They guarantee 99.9% uptime, but don't accept 3rd party logs (e.g., Pingdom) and don't monitor themselves. So you cannot prove anything. By the time you reach someone on chat, 20min+, the site is back up and they don't want to know. Complain and they blame your browser or some other bull. Its not just the web site either. Emails would also not be sent or received. I'd go to send an important email, last thing of the day, only to find it didn't send. I was giving them the benefit of the doubt, but after reading other reviews here I'll be jumping ship very soon. If you want to pick a web hosting company? Stay away from Hostgator! their customer services are really bad, if not the worst in the world! I have never seen anything like it! They employ people from Asia to do the service, not only their English are bad, as well as their manners. They take money out from my account for additional addons without my permission, so often, it takes time weeks to refund me the unjusted payment. I know they are popular, not any more! Contacted tech support 3 times vi chat, every singleton of them left the chat without giving an update on my issue which remains unsolved. Highly unrecommended! Find another hosting provider if you're looking for decent support, especially if you're not a tech geek. Absolutely not worth wasting your time and resources. I am tired of their terrible, unsupervised support with no action. Last month I was charged for a SSL 1 month early from renewal. I contact them asking to refund the early charge and they said no problem. 10 days later, they said they can not refund it and generated no ticket for the original request. This has happened at least 3 times in the last year, but this time was it. I have removed myself from their service. I am so tired of their poor service. Price and uptime are not bad, but if you need anything done it takes almost a week, and if you question them all you get is a around and lies - stay far away!